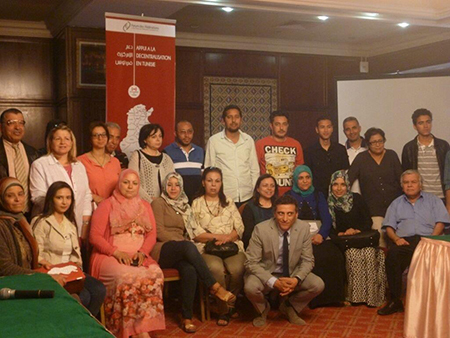 Forum held a workshop in Kairouan in the center west of Tunisia. The workshop was opened by Imen Houimel, General Director at the Ministry of Women, Family and Youth and Sheela Embounou, Head of Monitoring and Gender Programs who both spoke of the opportunities that a decentralised system of governance can open for future stability and economic development as well as the advances for Tunisian women’s rights as enshrined in the new constitution. Day 1 of the workshop focussed on the concepts of Decentralization and understanding how the new Tunisian constitution provides for decentralisation. Chapter 7, Articles 131 to 142 of the constitution address and validate decentralisation in Tunisia. Forum decentralisation expert, Makram Montacer provided an overview of the status of decentralisation in Tunisia and highlighted the issues that remain to be resolved from both a legal and administrative perspective. He stressed that decentralization requires the delegation of powers to elected local authorities, local governance through participation, transparency and accountability and the renewal of spatial planning policies. He also highlighted some of the challenges arising, including state restructuring, powers of local authorities, financing and taxation, cooperation, disconcerted administration and the promotion of investment and development. In Tunisia, the municipal and regional elections will be the nucleus of a democracy where the role of women is indisputable. In her presentation, Forum’s constitutional expert Salwa Hamrouni stressed that civil society must ensure the proper functioning of this process and must be vigilant as far as cost overruns. It must exert pressure on political power and ensure the smooth conduct of elections while respecting everyone’s attributions. Hayatt Lahbayli presented the concept of participatory budgeting which is defined as a process by which communities participate in the debate and the choice of projects and allocation of available funds and public resources. 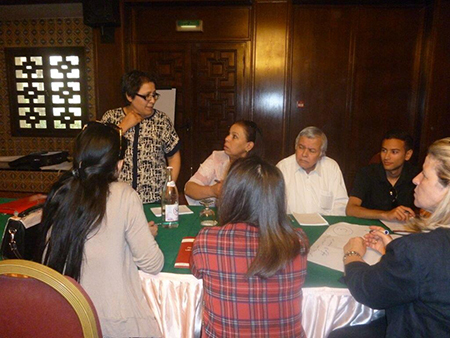 The Brazilian experience of Porto Alegre was used to illustrate how the participatory budget has reduced unpaid taxes, increased citizens’ awareness on local finances and decreased management costs. Mr F. Kaabi, Assistant Mayor of Kairouan in charge of Cooperation and International Relations, spoke about his experience as both a director and as an active member of civil society and the growing links and communication between civil society and the commune in Kairouan since the revolution. He stressed that decentralization is the responsibility of the trio: Commune, Civil Society and Citizen by redefining the role of the state. Day 1 ended with a group activity enabling participants to debate on the mechanisms needed to facilitate civil society’s participation in the decentralisation process. Discussions were lively as each group presented their proposed mechanisms. Day 2 focussed on decentralization and gender and the importance of ensuring the participation of woman in political and governance processes. Leila Haouaoui’s presentation introduced participants to the socio-economic dimensions of decentralisation and gender participation. 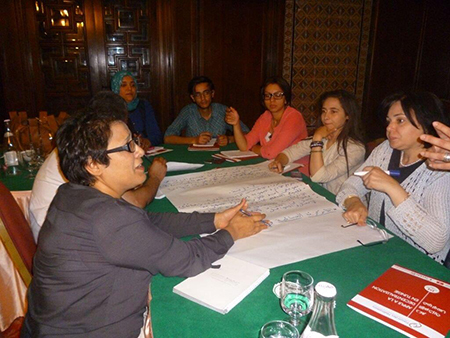 She demonstrated how regional inequalities in Tunisia and inequality between men and women had contributed to the failure of the economic model that led to the Arab Spring of 2011. She explained that decentralization offers more access points to the political participation of women than a highly centralized system. She also stressed that the participation of women is an important element in the growth and economic development and misunderstanding their role is a real shortfall in socio-economic terms. Salwa Hamrouni showed that decentralization promotes participatory democracy, stressing that local governance is inextricably linked to equality between citizens and it is not possible to reduce regional disparities without recognizing the suffering of women in the regions. She also talked about the importance of training women candidates and youth to participate effectively in the electoral process. Building on the Moroccan experience in decentralization, Hayat Lahbayli affirmed that gender equality could only reinforce a state’s engagement in favor of equality. She introduced participants to Gender Sensitive Budgeting (GSB) that enables linkages between gender equality, human development and economic efficiency. GSB is results oriented and allows better targeting of the needs of the population and better assessment of the impact of public action for more efficient and equitable use of resources. Day 2 ended with a group activity on the mechanisms to be established to increase the political participation of women and to mainstream gender into the process of decentralization.